Who Are The Rave Ons? I'm utterly shocked with myself for not having posted this, one of my all-time favourite song-poem performances, before. So annoyed in fact that today I'm giving you not one but two tracks from this utterly dreadful album. 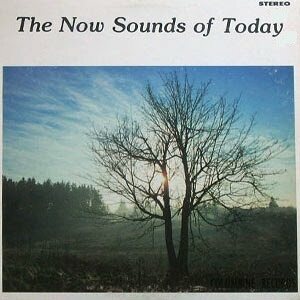 Over their many years in the song-poem field, Columbine Records issued dozens upon dozens of compilation albums under the title The Now Sounds of Today; if their catalogue is to be believed there could be as many as 300 or more. Each of them contained anything up to 20 different tracks, all from aspiring hit makers who really should have known better. Packaging these albums in dull, generic sleeves (often with different catalogue numbers printed on the sleeve and disc) saved both time and money, but budgets were non existent; musicians did not see the cue sheets for the songs they were singing before entering the studio. Even taking note of the ridiculous rate that Columbine churned this material out many of those musicians - consummate professionals and song-poem stalwarts like Kay Weaver, John Muir (aka Gene Marshall) and Ralph Lowe - managed to do a half-decent job, but when a band of no-hopers under the name The Rave Ons was brought in to do their thing - as they did for the first 14 albums in the series - their inadequacy and amateurism shone through. It's beyond belief that anyone at Columbine could have sanctioned the release of this drivel; yet more proof if you needed it of the contempt that these outfits had for the people stupid enough to send them their hard-earned dollars. The singer 'performs' in a garbled, high pitched whine racing through the lyrics at speed, clearly wishing that he wasn't there while the rest of the Rave Ons (keyboards, bass and drums) play the same basic tune on all of the cuts on the album, never managing to rise above the mediocre. All in all, they sound to me like the school band of my nightmares. So, two cuts from Columbine CRH-9 (or, if the label is to be believed USR 6171): Happy Inside of Me by Harry Booms and Foolish Heart by Lottie Ankey performed, as only they could, by The Rave Ons. Over at the rather wonderful Music For Maniacs there's been a bit of a debate going on recently about the origins of the disc I present for your enjoyment today, a 45 from Ric King entitled The Return of a Soldier. 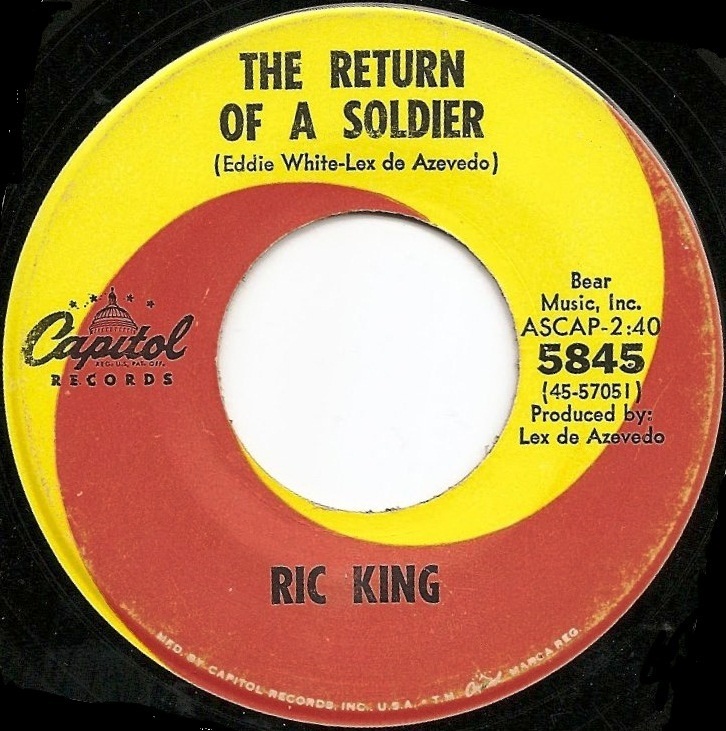 To cut a long story short the Capitol Records 45 (catalogue number 5845, fact fans) The Return of a Soldier, was co-written by one Lex De Acevedo a name which, through no fault of Mr De Acevedo (occasionally - as in this instance - spelled Azevedo, one would assume to make it easier to pronounce) himself, was mistakenly believed to be a pseudonym of the writer/producer David Axelrod. This erroneous 'fact' wasn't helped by Capitol when, in 2006 they put out the compilation CD Introducing the Four King Cousins and included the following in the liner notes: "Produced, arranged, and conducted by David Axelrod using the pseudonym Lex De Azevedo." Silly record company! The simple truth is that Lex De Acevedo and David Axelrod are two different people. Lex is a cousin to America's famous King Family (hence his credit on the Cousins album) and Ric King is his brother, Ric De Acevedo who is now a member of the post-Lettermen vocal act Reunion. David Axelrod and Lex recorded for Capitol at the same time during the mid sixties, so perhaps that's where the mistake came from - apparently, according to Lex's daughter, their offices adjoined too. De Acevedo is a Mormon musician and still active as a composer today, as is Axelrod - active, I mean, not a Mormon (at least not that I know of) - most famous for his work with the Electric Prunes and Lou Rawls. Now this has little or nothing to do with the record I present today, apart from offering a bit of interesting background and the thought that if record companies cannot credit their artists correctly what chance have we got some 40-odd years later? If you know Staff Sergeant Barry Sadler's mawkish mid-60s hit Ballad of The Green Berets you'll have some idea of what to expect, although Ric King's addition to the pile of Vietnam-inspired releases is particularly insipid and tasteless, dealing as it does with the post-life experiences of a freshly-deceased young man. This came from a batch of song-poem 45s received just yesterday but, such was my urgency to share this little treasure with you, I decided to forgo my Easter egg eating and waste no time in transferring this to MP3. 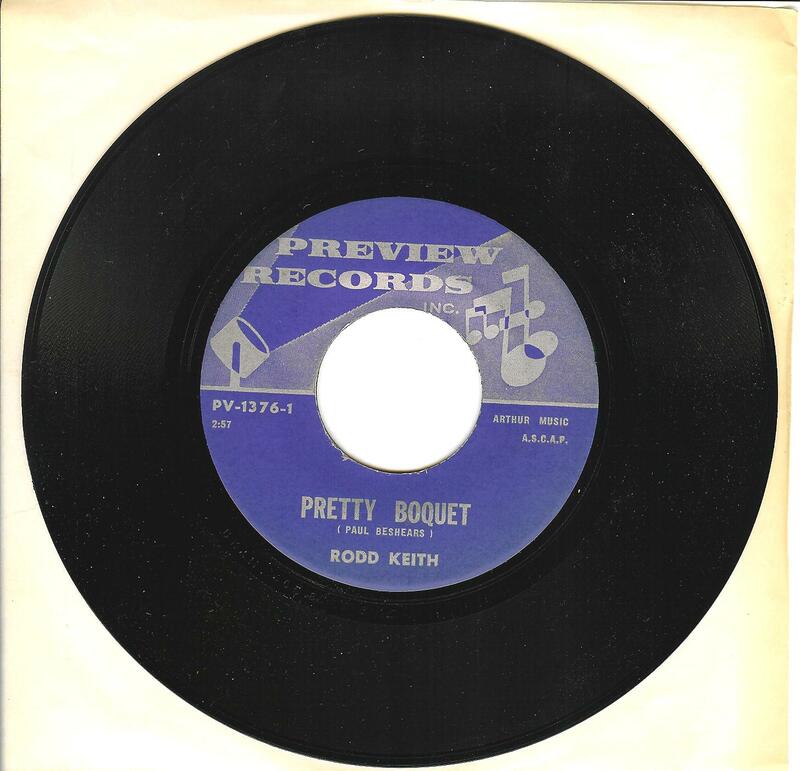 Many regular visitors to The World's Worst Records will already know about Rodd Keith, possibly the greatest of all the song-poem artists: multi-instrumentalist, arranger, singer, writer and producer of countless cuts for Film City, Preview, MSR, Circle-D and a dozen other outfits under a variety of different names. But no matter how well you think you know Rodd you will not have heard anything like this. You'll have heard Rodd sing in falsetto before, on the two versions of I'm Just the Other Woman for example, but the voice he uses here is quite extraordinary. Written by Paul Beshears, Pretty Boquet (and that's their spelling, not mine) is sung by Rodd in a bizarre high-pitched whine which makes him sound like a cross between the Bee Gees and Tiny Tim. I'm not quite sure what to make of it; at first listen I thought it was about a bride who died on her wedding day, but subsequent spins show that hopw was little more than a product of my damaged mind and warped sense of humour. As it turns out its simply a grotty little piece of sentimental slush with few redeeming features outside of Rodd's freakish performance. There are a few others in the same batch will will no doubt make an appearance at some juncture, but for now enjoy the peculiar Pretty Boquet (sic).